Looking for a super easy VEGETARIAN BBQ recipe or are you a fan of grilled artichoke? Here’s one of our FAVORITE recipes ever for a quick appetizer courtesy of Paul Stewart of the Palmetto Bay Sunrise Cafe. He was kind enough to fire up the grill and make it for us in this BBQ Video HERE. Nice. Use an extra hot charcoal fire for this one. Paul first discovered this treat in a small joint in the French Quarter in New Orleans. The trick is in sourcing the artichokes. The canned artichokes Stewart uses are packed in a light oil marinade and come from a major food purveyor for restaurants. Stem and all you can see they make for a spectacular presentation. Similar but smaller smaller serving sizes are available in specialty stores, gourmet outlets and on Amazon . Some quality parmigiano reggiano and salt and fresh cracked pepper is all you need to make it over the top good. Thanks to the Palmetto Bat Sunrise Cafe on Hilton Head for tip! 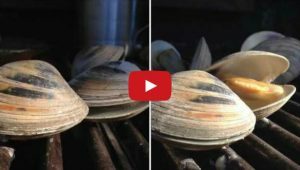 Grilled clams may be the easiest BBQ trick ever. 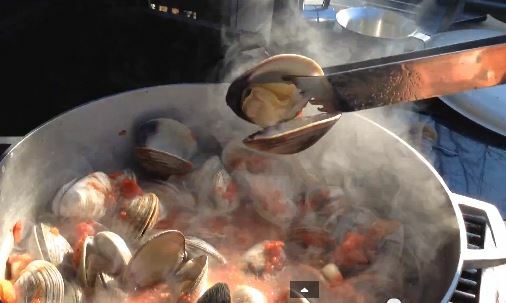 Add clams to hot grill. Watch ’em pop open (if they don’t – trash ’em) and add some drawn butter. 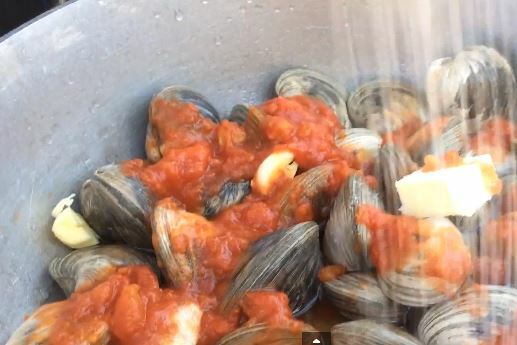 We recruited Chef Paul Stewart of the Palmetto Bay Sunrise Cafe to give the barbecue world a grilled clams recipe and another Clams Bordelaise recipe – a meal in a pot.